A solar bird bath offers a place where wildlife can drink, rest and relax in your own backyard. With constant flowing water, they will also be much safer, less prone to bugs and easier to clean than a traditional water bowl. In our search for the best solar bird bath we’ve researched and compared a ton of different options. These ranged from two-tiered traditional bird baths, to ultra budget friendly options. In the end, we decided the Smart Solar Ceramic Solar Bird Bath was the number one best choice. It has a wonderful vibrant blue exterior with a decorative flower motif circling the water bowl and base. The unit is made from ultra-durable ceramic and come with an integrated whisper silent solar pump for a hassle-free setup. Factoring in the price, features and build quality, this is simply the best choice out there. When it comes to solar bird baths, none are more upscale than the Sunnydaze Richwell Solar On Demand Outdoor Water Fountain. This high-quality resin and fiberglass unit features a stunning two-tiered design, integrated LED lighting and a powerful solar pump for long lasting performance. It also boasts an internal battery bank for up to 6 hours of run time whether or not the sun is shining. Additionally, it measures in at 19” wide and 31” tall allowing for multiple birds and creatures to drink and bath at once. If you’re looking for the best that money can buy, this would make for an incredible backyard addition. Solar bird baths don’t necessarily have to cost an arm and a leg in order to be high quality. This is particularly true when it comes to the Smart Solar Somerset Verdigris Solar Bird Bath Fountain. For a low-priced option this solar bird bath offers an incredible design, efficient performance all in an eco-friendly package. With an 18” bowl that can hold up to a gallon and a half of water you’ll have birds flocking to your yard in no time. Plus, at 2” deep the bowl will reduce water evaporation and require significantly less maintenance. If you want something affordable and that just works, the Smart Solar Somerset is a perfect option. In this section we’ll take an in depth look at all of our top rated solar bird baths. We’ll be covering features, materials, sizes and more for a truly comprehensive look. Once you’ve taken a look at what’s out there, it gets much easier to make a more informed buying decision. 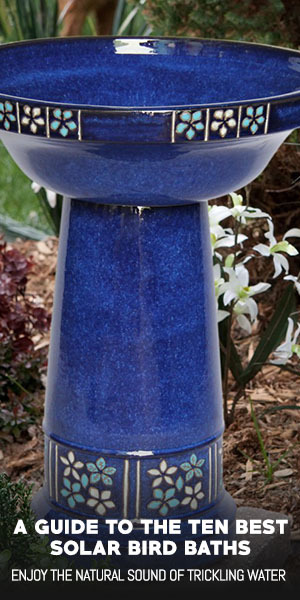 The glazed royal blue Smart Solar Ceramic Solar Bird Bath is truly a sight to behold. With a large 17” diameter water bowl and a decorative flower motif it easily stands out from the crowd. It features a high quality solar panel and pump assembly in the center of the bowl. The assembly is easily removed for maintenance and easy cleaning. The unit comes in three pieces that require a bit of assembly, the base, bowl and solar pump. It should only take you a few minutes to have everything ready to go and at 32 pounds it’s easy to test out a few locations for optimal sun exposure. While this unit doesn’t have an on and off switch, it’ll automatically begin to pump as soon as the sun’s rays are strong enough. Related: Grab some EasyCare FounTec Algaecide and Clarifier to keep your water clean and clear. Once operational, the Smart Solar Ceramic Solar Bird Bath provides a pleasant gurgling sound for your backyard. It also sprays upwards so birds can easily bathe and frolic in the clear, cool water. It’s incredibly just how stunning this bird bath looks in the sun. The moving water and gushing fountain provide a sense of tranquility and peace. Plus, you can expect birds and animals of all shapes and sizes to give your new solar fountain a visit. The only real downside to this unit is its sensitivity to sunlight. If a large cloud passes overhead the pumps power will be reduced dramatically until the sun returns. Overall however, this a brilliant addition to any backyard and with such great features and low price point it’s easily the best solar panel on this list. The Patriot Lindenwald 2 Tier Round Solar Birdbath is an exquisite outdoor accessory. With two tiers and standing at 30” tall, it provides a great focal point for a garden or patio. The integrated pump and solar panel are both located on second level. The pump is quite powerful yet still very quiet, perfect for hearing only the burbling water. They are also well hidden so as to not take away from the overall look of the unit. You’ll also get a selection of nozzles in the box so you can choose a specific water effect such as a spray, shower or bubbler. The detailed design elements and traditional color make this an excellent conversation pieces as well. Assembling the Patriot Lindenwald 2 Tier Round Solar Birdbath is also a walk in the park. With only a few pieces, it can be put together in under 10 minutes. As soon as you put it out into the sun you’ll see and hear the water trickling over the bird bath. Another great feature is the built in back up battery. This is perfect for cloudy and overcast days and will keep your fountain running for up to six hours with little to no sun. Even better, as soon as night falls the Lindenwalk Solar Birdbath has four LED lights to provide an incredible glow and look amazing. Overall, this is a beautiful, high quality solar bird bath that will soon be the centerpiece of your backyard. The Smart Solar Acadia Solar Birdbath is a cute addition to an outdoor garden. It creates a wonderfully relaxing atmosphere and is a natural terra verte green color. You can expect to have flocks of birds visiting your yard in no time. Plus, it even has a pair of adorable creatures on the rim to keep you entertained while waiting. The Acadia also comes with an underwater solar panel for a more natural and less industrial look. When up and running you’d never even know it was there. If any solar bird bath was at home in the outdoors, it would definitely be this one. On top of the amazing design and visual appeal, the Smart Solar Acadia Solar Birdbath also has a very low maintenance design. This is perfect for folks who would rather watch little critters running around than clean a dirty pump filter. You’ll also be pleased to hear that assembling this unit is very quick and straightforward. It comes in a few pieces that are easily put together in a matter of minutes. Plus, as this is made form Glass Fiber Reinforced Concrete it is more than capable of lasting for many years in even harsh conditions. When you take all this into consideration and add in the ultra-quiet low voltage pump, you’ve got yourself one hell of a good product. 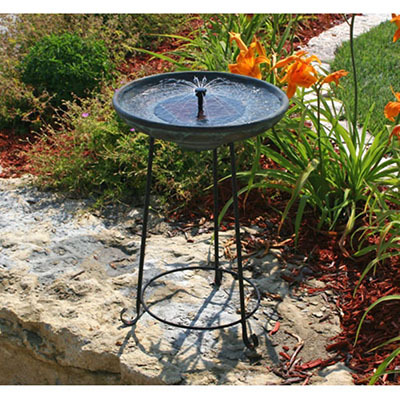 As our number one budget pick, the Smart Solar Somerset Verdigris Solar Bird Bath Fountain is a wonderful addition to this list. With a large 18” Resin bowl and a beautiful wrought iron frame this bird bath makes quite a statement. We love the rustic green, brown and black coloring as it gives the whole unit a very natural tone. Plus, the open iron frame design makes it easily blend into the surrounding greenery. If your looking for a solar powered bird bath that doesn’t distract from the other elements of your yard, this would make for a great lost cost option. Related: Throw some glow stones in to give it a stunning night time glow. On top of that, the Smart Solar Somerset Solar Bird Bath has a very eco-friendly, low voltage pump. The integrate solar panel is cleverly hidden under around 2” of water for a more natural look. Meanwhile the spray nozzle extends around 3” into the air and produces a wonderful trickling sounds and shoots water across nearly the entire bowl. We do want to mention though that the pump and solar panel are fairly weak and need to be in direct sunlight to work. Even the smallest cloud can result in the pump not functioning at all. However as soon as the skies clear, it’ll start working automatically. Overall this is an excellent low cost solar bird bath that has a natural look, clever design and make for an incredible addition to any backyard. 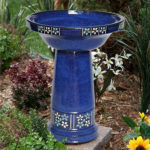 The Best Choice Products 2-Tier Solar Bird Bath Fountain makes for a perfect outdoor accent piece. It features a water lily and blossom engraving that elegantly curves around the base and bowl. You’ll also be pleased with the natural gray color that goes very well with surrounding natural elements. The combination of colors, textures and style make this a wonderful outdoor conversation piece and the birds absolutely love it. Due to it’s rugged construction you can expect this bird bath to stand up to even 40 mph wind gusts with ease. Plus, it’s super easy to set up and will only take a few minutes before you can have it up and running. We were also please to see that is has an on/off/automatic dial so you can choose when and if it runs for a more customizable bird bath experience. The solar panel and pump are located on the top most tier for maximum efficiency and visual appeal. Even more the BCP 2-Tier Solar Bird Bath Fountain comes with a built in solar rechargeable batter for up to 6 hours of operation in total darkness. This is great for cloudy days or nighttime festivities. It also comes with 4 LEDs that glow in the evening. This provide a stunning lighting effect and truly make this an amazing piece to behold. In the box you’ll also receive 4 different water spouts so you can choose the perfect water effect for your landscape. Whether you want a nice halo of water, a burbling stream or a vertical fountain you can quickly and easily make the choice. Overall this is a versatile, visually appealing and super durable solar fountain that has a ton of great features at a very affordable price point. 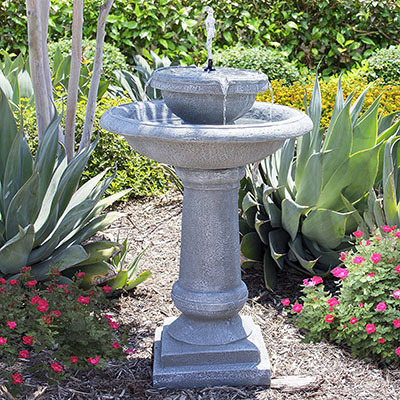 When it come to high end solar bird baths, none are better than the Sunnydaze Richwell Outdoor Water Fountain. 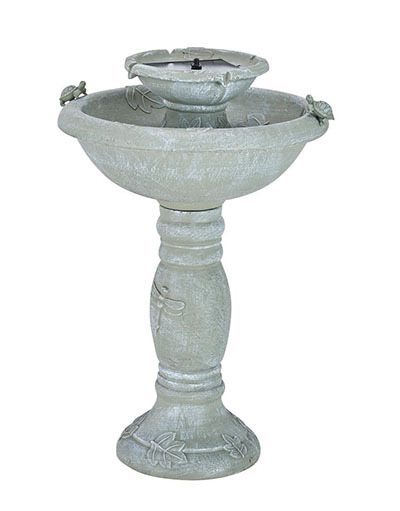 This stunning two-tiered fountain is crafted from ultra-strong fiberglass reinforced resin for a durable and long-lasting bird bath. Due to it’s large design it can hold up to three gallons of water for minimal evaporation and refilling. The Richwell fountain also has an incredible water fall effect that produces soothing sounds and is attracts birds left and right. We were also please to see that the unit had a built-in backup battery so it can run during even cloudy days. On a single battery charge you can expect to get around 4-6 hours of moving water, perfect for an evening get together. As this is a high end solar bird bath, it has the features to match. The Sunnydaze Richwell Solar Water Fountain has multiple LED built in that general a perfect ambient lighting. They are strong enough that if you place it under a patio cover it’ll display beautiful water and light effects on the ceiling. Not only that, but the entire unit is super simple to set up and it’ll take only a few minutes max. The solar panel is a standalone unit as well so you can position it in the sun and have the birdbath under a tree, patio or shaded spot. This is something that many of the fixed solar panel units simply cannot do. Overall this is our number one high end solar bird bath due to it’s features, style and ability to work in nearly any lighting conditions. With a gorgeous stone design and two decorative cedar waxwings already perched on the bowl, the Wishing Well Solar Fountain is easily one of our favorite choices. It has a powerful pump that creates a delicate water bubbling sound that can be heard up to 15 feet away. 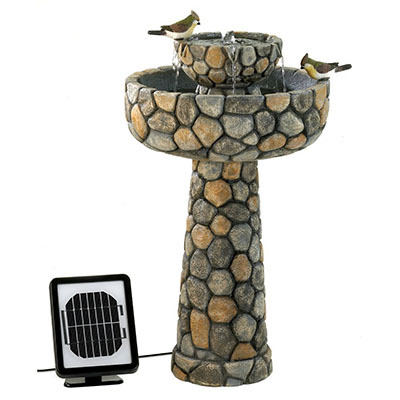 One of the great features of this bird bath is the ability to run on AC or on solar power. It comes with both connections making this a very versatile choice for when large clouds roll in or for evening parties. You’ll also be impressed with just how much water circulation this unit has. It can seriously move and is great for preventing algae and bacterial. Assembling the Furniture Creations Wishing Well Solar Fountain is a snap. There are three main pieces as well as the solar assembly and in total it’ll take you no more than a half hour to fully erect the fountain. Once completed it can be filled with up to 2 gallons of water for enhanced evaporation protection and less maintenance. The post mounted solar panel is easy to position and can be angled for maximum solar collection. You’ll also be provided with an 8’ power cord which allows the solar panel to have an extended reach. Overall this is an incredible decorative bird bath and looks great in a raised flower bed or garden. If you looking for a visually appealing option, this would make for a great choice. This lightweight poly-resin solar bird bath has a traditional and timeless look. With an elegant two-tiered design, classic grey stone coloring and a symmetrical faux stone base it is an excellent garden accent piece. 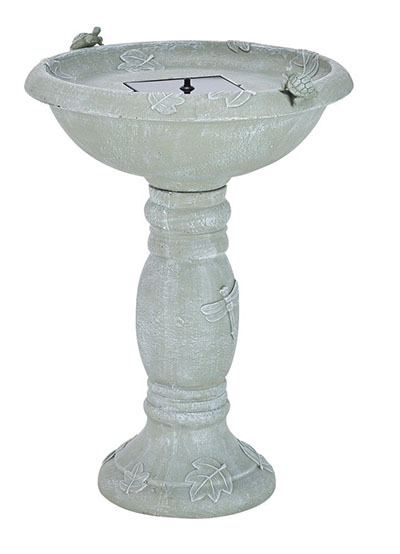 The BCP Solar Powered Stone Bird Bath Fountain comes with a variety of different spouts. This lets you choose from a fine spray, gurgling brook, shooting stream and more. Plus, with a whopping 2.5-gallon capacity it’ll last for days without needing to be refilled. We were also impressed with the sizable base. This help to prevent it being blown over in strong winds and really give it that high end feel. The Best Choice Products Solar Powered 2 Tier Stone Bird Bath also features a high powered, built in solar pump assembly. This easy to use system is great for those who aren’t DIY savvy and make setup super simple. Even better, it comes with a built in 6-hour rechargeable solar battery. This allows it to work during the night, on cloudy days or even during a solar eclipse! Many lost cost options tend to omit the battery to save on costs. You’ll also have to ability light up the fountain at night with the four, super bright LED’s. They provide an excellent mood lighting and go a long way to making this solar fountain a thing of beauty. Overall, this is a wonderful budget solar bird bath that has many high-end features. 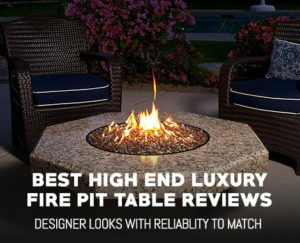 While it isn’t made from real stone, it requires a lot less maintenance and still looks amazing on a garden or patio. Whenever the sun is shining you’ll be treated to the delightful sound of trickling water and chirping birds. The Smart Solar Country Gardens Solar Birdbath Fountain is basically a magnet for wildlife and works incredibly well. We did notice that the water will turn off when a cloud passes overhead. This is due to the lack of a backup batter or AC connection. However, that also allows this to be a low priced and lightweight unit which are both very important aspects. Overall, this is a great traditional solar bird bath and particularly for animal lovers is a perfect choice. Last up on our list is an upgraded version of the above solar bird bath. This two-tiered, traditional styled bird bath makes for an incredible outdoor accent piece. It not only has two small turtles crawling along the water bowl, but it as a half size second bowl. This is great for collecting some additional sun as well as adding a height element to the piece. Overall the Smart Solar Gray 2-Tier Solar Fountain looks higher end and more luxurious than its slightly cheaper alternative. We are also huge fans of the decorative leaves that surround the bas as well as the lively dragonflies that are winding their way up the pedestal. However, the Country Gardens 2-Tier Solar-On-Demand Fountain still has a few of the same problems as well. Namely no backup battery which leads to limited performance and the inability to work during shady periods. While this isn’t a huge drawback, it is something you should keep in mind. We love the 38.5-pound weight of this bird bath as it made it very resilient to the wind and kept it from blowing over. The stone texture also is a prefect replica of realistic stone and blends in with other outdoor elements. In Summary this is a great upgrade and is a durable and reliable option, especially considering the price. Buying a solar powered bird bath is a mix of personal taste and technological know-how. This guide covers everything you could want to know about owning one including maintenance, recommended features, accessories and more. After reading this you’ll have a good idea on what to look for so you can make an informed, stress free purchase. A solar bird bath is a great way to make your own personal bird watching sanctuary. Not only are they very attractive, but they are also extremely low maintenance. 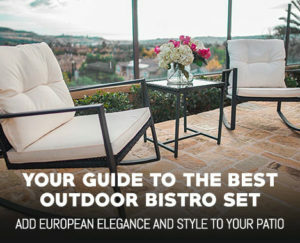 Due to their built in solar panel you won’t have to worry about cords or tripping hazards. Plus, most solar bird fountains are very energy efficient. This means they can run on even overcast days. Another great feature is their whisper quiet pumps. Larger corded bird baths are often loud and can even scare birds away. Solar fountains are much safer and offer a more tranquil environment for our winged friends. Another great reason to consider purchasing a solar bird bath is to reduce microbial buildup. When using a traditional still birdbath, it’s very easy for mold and mildew to accumulate on the bowl. You’ll also find that mosquitoes and insect larva tend to breed in stagnant water. Solar pumps provide constant flowing water which is great at deterring insects and microbes. In turn this makes for a healthier environment for bird as well as for your family. After all nobody wants a mosquito farm in their backyard. 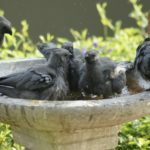 When it comes to choosing the right solar bird bath, there are a few key factors you should keep in mind. The first is obviously design. You’ll want to get something that feels natural and fits in with your existing gardens and decor. Bright colors are great for a light and airy feel while darker stone provide a sense of traditional elegance and style. Another choice you’ll have to make is a double or single tiered fountain. A second tier provide a better overall silhouette but it can sometimes become a bit too much for the surrounding space. Next up you’ll want to consider what material the solar bird bath is made from. Stone, ceramic and reinforced concrete are all great choices. Stone and ceramic will generally be more expensive but they have a high end feel to them. Reinforced concrete however will often be lighter and typically more durable due to its engineered design. Occasionally you’ll also come across a plastic bird bath. We’d recommend you don’t purchase plastic option as they are easily damaged by the sun and quickly become brittle when exposed to UV rays. In general, a good material guideline is, if it’s heavy it’s probably of superior quality. Lastly, you’ll want to pay attention to the size and power of the solar panel. Typically, larger panels provide more power (watts). This lets you have greater water flow and a more dependable bird bath. Bigger panels also make it easier for the pump to run when there are clouds or low light conditions. Another factor to consider is solar panel placement. Some pumps have built in panels, while other require a standalone satellite unit positioned near the bird bath. Both are great options with the satellite panel having more versatility and the built in being easier to set up. Whichever you choose, it’s hard to go wrong. Maintaining a solar bird bath is actually quite simple and help to reduce water born pests, increases pump life and make your bird bath look like new. Below we’ve listed a few handy tips that’ll keep your solar fountain in tip top shape. When you’re topping off the bird bath, go ahead and drain all the water out to prevent microbes from growing. After any large winds you wipe dust off the solar panel so it can maintain maximum power and efficiency. When cleaning the solar powered bird bath, it’s a good idea to give it a good spray with a hose to clean up any hard to get debris and sticky residues. If you can, position the bird bath in such a way that the panel is in the sun but the water is shaded. This will reduce evaporation and help keep the water nice and cool. After mowing the grass it’s a good idea to scoop out any loose grass clipping so they don’t clog the pump or gum up the pipes. To clean a solar bird bath all you’ll really need is a good scrub brush, a pair of rubber gloves and a bit of bleach to kill any nasty critters that might be breeding in the bowl. A quick scrub with the bleach should get rid of anything fairly quickly. After cleaning, give the water bowl a few hours to completely dry before filling it back up with water. While solar powered bird baths are self-contained units, there are a few accessories that can make them last longer and provide a bit of extra wildlife to your backyard. 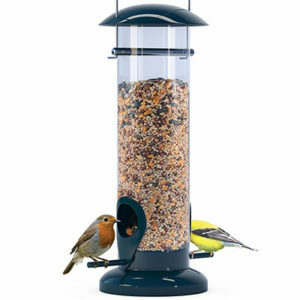 Weather Proof Anti-Bacterial Bird Feeder is a great low cost option and will go a long way to increase your animal viewing pleasure. Even more, it looks amazing in a backyard and has some wonderful features that make is safe and extremely resistant to damage. Nothing is worse than a nasty green bird bath that smell quite foul. Thankfully there are a ton of great cleaner to keep your solar bird bath looking and smelling like new. One of the best on the market is EasyCare FounTec Algaecide and Clarifier. This great cleaner removes nearly all algae and keeps your water looking sparklingly clean. Plus, is it safe for plants, birds and wildlife so you won’t have to worry about them drinking the water after cleaning. If you live in a cold climate there is a good chance the water freezes for at least part of the year. However, the K&H Pet Products Ice Eliminator Original Birdbath Deicer is a great way to get year long enjoyment out of your solar fountain. It provides a gentil heat that kicks on at around 34 degrees Fahrenheit and will keep you water from freezing at temperatures above 20 degrees. When most of the other bird baths freeze over, yours can still be happily running and the neighborhood birds will simply love you for it. Plus, you’ll have a great time seeing the birds in a winter environment with a cup of hot cocoa and a good book. The final accessory on our list is a good strong bird bath brush. The Songbird Essentials SE601 Bird Bath Brush is a great way to keep your solar bird bath fresh and looking like new. It has coarse bristles that do a wonderful job of removing buildup and the handle is ergonomically designed for extended use. 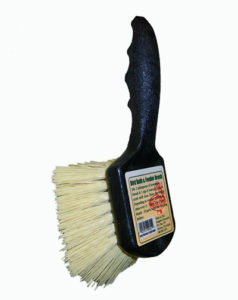 Even more, the brush head is nice and wide which makes bird bath cleaning a quick and easy task. If you don’t already have a good scrub brush at home this is a must have bird bath accessory. A solar powered bird bath is an incredible addition to your backyard. They attract wildlife, provide a soft gurgling ambience and look great. Plus, they are fairly cost effective and require little to no maintenance. All of the choice we’ve reviewed above will work incredibly well and help to give your back garden a new lease on life. If you hate cord and loud pumps, a stylish solar bird bath is the way to go. If you’ve got other standing water features such as a pond or even an old traditional bird bath, you might be interested in looking at a few solar water pumps. They help circulate the water and provide a bit of added visual appeal to any backyard.